Fundamental value for our Group is the health and safety of our employees as well as residents of local communities and our installations. Health and Safety Policy and Management System. Its policy, which considers the issues of health and safety as a primary prerequisite and management commitment at all Group’s operations. The policy explicitly states that safety, health and environmental protection are always first priority. This policy is implemented through a complex and multifaceted safety management system. • A Corporate Occupational Health, Safety, Environment & Sustainable Development Division. • Division for Health, Safety and Environment of refineries. • Division for Health, Safety and Environment at each facility. • Division for Health, Safety and Environment of EKO, HELLENIC FUELS and EKO Kalipso subsidiaries. • Appointed safety technicians, in-house physicians communities which are located close to our industrial facilities. As a result, HELLENIC PETROLEUM takes all the necessary measures to provide a safe workplace to its employees, partners, visitors and trainees in all of its workplaces. • Internal Service for Safety and Prevention (ESYPP), according to P.D. 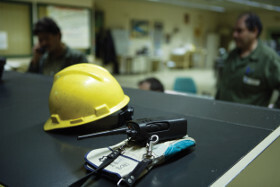 95/1999, whose key objective is the information sharing between facilities about accidents and prevention and protection measures taken to avoid recurrence as well as the surveillance of employees’ health. • Employee Committee for Occupational Health & Safety (Ε.Υ.Α.Ε.) at each facility which is comprised of representatives of all employees elected by the employees (according to Law 3850/2010). Every employee has the right to be elected for these committees (100% participation) which meet on schedule with the facility’s management and recommend Health & Safety improvements in the workplace. The Group applies a precautionary approach in the field of occupational risk management, so that potential health and safety risks can be anticipated and as a result, controlled. Specifically, any such potential risks are identified and consequently controlled according to criteria as set forth in Greek legislation (Law 3850/2010) as well as European and international codes and good practices. Written occupational risk assessment studies feature in all of the Group’s facilities and include measures that need to be taken to eliminate or control hazards - thereby keeping them at low and acceptable levels. The studies themselves are developed (taking employees’ opinions and viewpoints into account) through employees filling out questionnaires concerning the nature of their work as well as the environment that they work in and are revised whenever working or environmental changes take place (in the event that no changes arise, every five years at the most). These revisions are communicated to all staff so that each and every employee is aware of the risks that he/she may face as well as the required actions that need to be taken in order to eliminate or minimize them. During the scheduling of corrective safety actions, immediate priority is given to those considered most critical, as classified according to their ranking in the Risk Assessment Matrix. Scheduled safety inspections performed by internal and independent external auditors are conducted at many levels. Depending on the findings that surface, actions for further safety improvement are planned and implemented. • The GHSESD in order to diffuse experience, knowledge and good safety practices among Group’s refineries and subsidiaries. In 2015, new scheduled safety audits were conducted as always on process safety in refineries, marketing companies as well as Diaxon, while special emphasis was given to the follow-up of pending ions from previous audits in industrial facilities BEA, BEE, ΒΕΘ. • Τhe management and engineers, from different units of an industrial facility, aiming, directly, to identify and correct unsafe behaviors and indirectly to the effective participation of staff executives to improve safety. In fact one safety visit takes place, per week, at each production unit. • The Departments for Health, Safety and Environment at each facility. • Independent, internationally recognized and experienced inspectors (third party auditors), on company’s invitation; or experts of companies providing insurance coverage to Group’s industrial installations. • The relevant authorities for major accident prevention (SEVESO inspections).